Ticket Printing is rated 4.6 out of 5 by 15. Complete your event with customized tickets. Rated 5 out of 5 by craige from Great customer service and really nice tickets! Everything went really smooth. Ordering is easy, they customer relations team helps resolve issues, and tickets were shipped ontime and quickly. I got Matte finish and the print comes off a little too easy. But not a complaint because price was good. Rated 5 out of 5 by Dwina649 from Quick Turnaround and Quality Product! Purchased Tickets and I am happy with the outcome. The site was easy to navigate and the items came within a week of ordering. I also had to make a few minor changes after I submitted the information, changes were easy to apply. Tickets turned out great! Will be using this company again. Rated 5 out of 5 by Pickaxe Blues from Easy ! Easy to design, quick printing and delivery, and just what I needed. Will be back! Our custom tickets are available in standard 2"x5.5", 2.75"x5.5", 2.75"x8.5" and 3.5"x8.5" ticket sizes. Perforation and numbering options make them easy to use for raffles, since guests can tear off and keep a matching numbered stub. You can specify starting numbers and the numbering location as well. Plus you have the option to print on one side or both. PrintPlace.com's ticket printing is the perfect solution for parties, raffles, and conventions. With some of the fastest turnaround times in the market, your order is ready for shipping or pickup as soon as one business day. You can print tickets in quantities as low as 50 to as high as 10,000 -- perfect when you need to organize important events of any size at short notice. Perforations are small, punctured holes placed for easy tear off. It is commonly used for coupons, stubs and return forms. Indicate the locations of the perforation line on your file by adding broken lines. Up to 3 parallel lines. 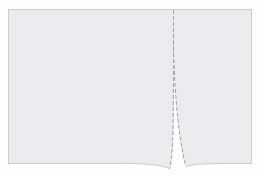 Perforation line must be at least 1/8" away from the edge that it is parallel to. Multiple perforation lines must be at least 1/8" apart. Perforation lines can be placed on the folding line for folded items. To create custom tickets or any custom order, give us a call or fill out our custom order form. 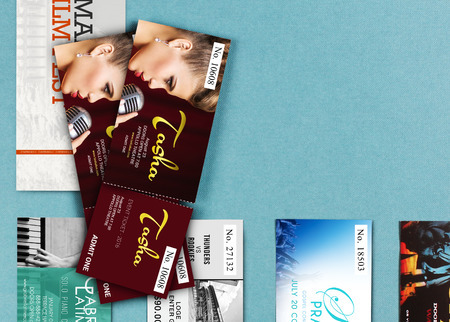 Our ticket layout templates will help you properly create your design. They show you the exact size your artwork should be to print with a professional look. They can be downloaded through a desktop PC in AI, PSD, PDF, or JPG formats combined into one .zip file. Our custom tickets are created in the standard 2" x 5.5" ticket size. Perforation and numbering options make them easy to use for raffles, since guests can tear off and keep a matching numbered stub. You can specify starting numbers and the numbering location as well. Plus you have the option to print on one side or both.